From Goodreads ~ WILL THEY DIG UP THE TRUTH? When a rash of college students falls seriously ill after ingesting Molly, a “club drug” also known as ecstasy, Officer Megan Luz and her K-9 partner, Brigit, are tasked with tracking down the dealers. Going undercover at the university leads Megan closer and closer to infiltrating the drug trafficking ring. But when the investigation implicates her former partner and workplace nemesis, Officer Derek Mackey, Megan’s powers of discernment are put to the test. Thwarted when the Feds seize control of the investigation and frustrated by the lack of attention the DEA is putting into the case, Megan continues her own unofficial investigation with Brigit’s help. But when the trail leads them in an unexpected and dangerous direction, Megan and Brigit find their own lives at risk. Can the K-9 team take down those in power? Or are some criminals simply above the law - and paw? Megan is a police officer in Fort Worth, Texas. Her partner is Brigit, a German Shepherd. The majority of their job is patrolling the streets and responding to calls. There has been a rash of overdoses by university students on a drug nicknamed "Molly". Megan jumps at the chance for her and Brigit to go undercover as a university student and her service dog, enrol in classes and move into a dorm so she can determine if the dealer is connected to the university. I've read many books by this author and I liked this one. 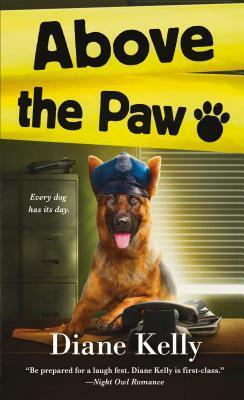 It's the fifth in the Paw Enforcement series ... reading the first one had introduced me to this author and then to her Tara Holloway series, which I'm enjoying. Though it is part of a series, it works as a stand alone and you don't have to read the others to know what's going on. I liked the writing style ... it was amusing at times. It is written in first person perspective from Megan's point of view and third person perspective from Brigit's point of view (which is funny) and the Dealer's perspective. As a head's up, there is swearing. I like Megan. She's getting more confident as time goes on and her ambition is to become a detective. Brigit's funny and likeable and it's fun to get into her head.